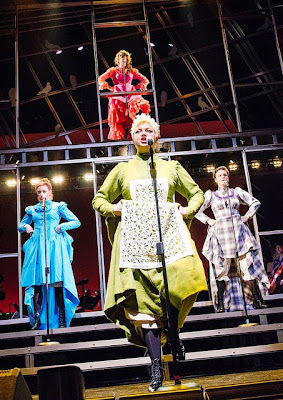 "A rock-show retelling of the bloody legend of America’s favorite ax-wielding double-murderess and Victorian hometown girl. Lizzie Borden, who has become fodder for jump rope rhymes and TV movies of the week, was a Massachusetts woman who was acquitted in 1892 of the ax murders of her father and stepmother, and lived the rest of her life as American’s first infamous tabloid star. But did she really do it? And if so, why?" The estimated run time is one hour and 45 minutes, including one intermission.